Jotham Scerri Diacono and Jan Rossi have recently assisted the Cousteau Foundation with its activities in Malta. 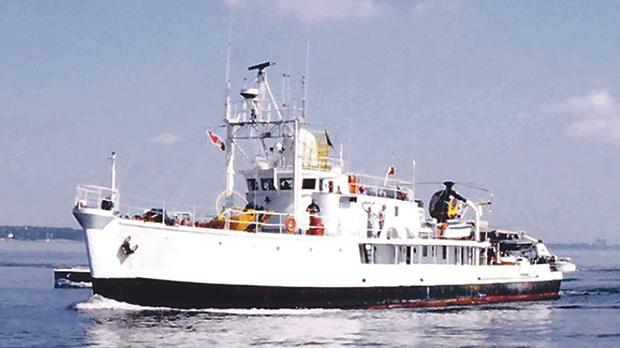 The Calypso, Captain Jacques-Yves Cousteau’s ship. Life has a funny way of going round in circles. We all know about the adventures of Captain Jacques-Yves Cousteau. Many of us recall eagerly watching his TV episodes on board his famous scientific ship, the Calypso – a symbol of his epic adventures. What most will not know is that Captain Cousteau had initially acquired this ship in Malta in 1950. The Calypso was originally a US-built mine sweeper. It was commissioned by the Royal Navy and assigned to active service in the Mediterranean Sea, based in Malta. After its decommissioning in 1946, it remained laid up in Malta. For a short while, it was used as a ferry between Marfa and Mġarr, Gozo. Mr Cousteau discovered the Calypso in 1950 when he travelled to Malta to find a suitable ship for his new adventures. He immediately knew she was the one and so began his worldwide sea explorations. Cousteau sadly passed away in June 1997. The Calypso was passed on to his foundation Equipe Cousteau and now, almost 70 years after the ship’s original purchase in Malta, the foundation re-registered Calypso in Malta. In tandem with the registration of the Calypso under the Malta flag, the Cousteau Foundation has also secured a deserving place in the Malta Maritime Museum in Vittoriosa. The Malta Maritime Museum is expected to undertake extensive restoration works and once it is re-opened in 2021, a floor in the newly restored part of the museum will be dedicated to the legacy of the Calypso and the works of Jacques Cousteau. The exhibition is set to display numerous artefacts used by Captain Cousteau during his fantastic adventures as well as a wooden rib taken from the original Calypso. In the true spirit of Captain Cousteau, the main aim of the exhibition will be to highlight the importance of actively protecting the marine environment and its treasures for the benefit and well-being of present and future generations. Jotham Scerri Diacono and Jan Rossi from Ganado Advocates assisted and advised the Cousteau foundation on the registration of the Calypso under the Malta Flag and also led the negotiations with Heritage Malta culminating in the agreement reached with the Maltese authorities for the Cousteau foundation to open an exhibition in 2021 within the newly refurbished Malta Maritime Museum.